"The King of Rock n' Roll"
Elvis Presley was born on January 8, 1935, in Tupelo, Mississippi. 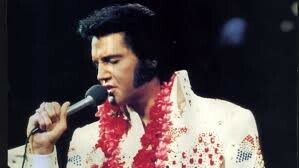 His first hit song was in 1955 and called "Heartbreak Hotel". He Acted in films such as "Blue Hawaii", "Girls! Girls! Girls! ", and "Viva Las Vegas". This is a picture of Elvis on stage preforming. This is a picture of Elvis and his daughter. 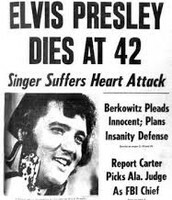 This is a picture of the news article that was published after Presley was found dead. Elvis and Perscilla had a daughter. Sadly Elvis and Perscilla divorced shortly after and Perscilla received custody of Lisa Marrie. He also had an addiction to prescription drugs. 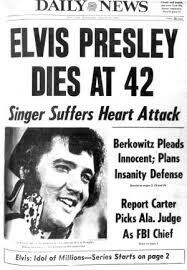 Elvis Presley died August 16, 1977, of heart failure at age 42. His death was later determined to be related to his prescription drug abuse.